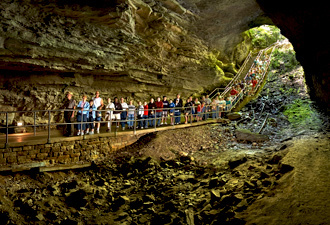 Here at Mammoth Cave National Park, adventure waits beneath your feet. Caves are all around you at Mammoth Cave—in the hills, and under your shoes. The longest cave in the world is here, waiting to show you things you've never seen before—geologic marvels, natural museums of stone, strange creatures, and hidden rivers. Stories of ancient cultures and intrepid explorers echo through mysterious chambers. Discover adventure in the cool, dark, silence of Mammoth Cave. Year round (excepting December 25) the park offers ranger-led cave tours that vary in distance and time. Do you have a toddler who is trying to be a walker? Take his hand and follow your guide along the short Frozen Niagara Tour to see stalactites and stalagmites. 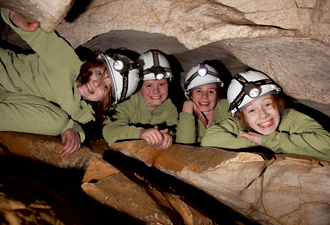 Interested in cave explorers? Try the two-mile Historic Tour and retrace the footsteps of Stephen Bishop, a slave guide who crossed Bottomless Pit in 1838. Want to go for an underground hike? Descend into the Grand Avenue Tour and see four miles of tubular passageways, narrow canyons, and underground hills. Still want more? Are you up (or down) for the Wild Cave Tour? Get ready for five miles and six hours of duck-walking, crawling, slithering, and climbing—you will get dirty on this trip and use muscles that you didn't know you had. You'll also find adventure on the surface side of Mammoth Cave National Park, in the park's steep hills and deep hollows. Frontcountry trails lead to dramatic features, like cave springs, limestone bluffs, and deep sinkholes that hint at the subterranean wonders beneath. Hike, ride bikes, or travel on horseback on the many miles of the park's backcountry trails. Leave civilization behind as you backpack through tall trees to a secluded backcountry campsite. Paddle down the riffles and pools of Green River. You can stay overnight on an island if you like. Throw in a line and fish in the park—no license is required. Find a quiet, tranquil campsite, or pick one where you can enjoy the night chorus of owls, tree frogs and cicadas—at Mammoth Cave National Park, you make your own adventure. 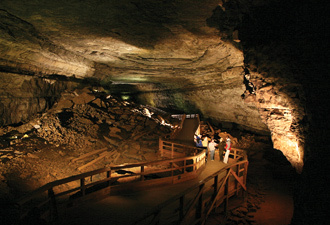 Mammoth Cave isn't just a dream trip—it's also a practical one for budget-minded travelers. In addition to its natural phenomena—a mammoth cave, rugged terrain, and scenic river valleys—Mammoth Cave National Park, in south central Kentucky and just off I-65, is within a day's drive of one-third of the residents of the United States. Come visit for a week or a weekend.